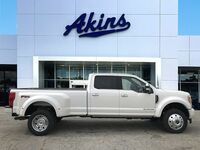 The hardworking and lovable behemoth of the 2019 Ford Super Duty lineup has arrived here at Akins Ford near Atlanta, GA, and its debut brings with it all the best-in-class features and capabilities you’d expect from a new Ford Super Duty lineup. We’re talking, of course, about the 2019 Ford F-450 Super Duty lineup and its best-in-class power ratings, best-in-class towing ratings and best-in-class payload rating. In addition to those best-in-class features and capabilities, the 2019 F-450 Super Duty lineup also features numerous class-exclusive safety, technology, comfort and convenience systems that make utilizing those best-in-class power and capability ratings easier than ever. That includes a class-exclusive integrated tailgate step that features an all-new Step Assist system that makes loading up the back of your 2019 F-450 Super Duty easier than ever, and a class-exclusive Trailer Reverse Guidance System that features all-new visual guidelines to make towing a breeze. The 2019 F-450 Super Duty lineup can also feature up to seven cameras for enhanced and optimized safety and maneuverability. 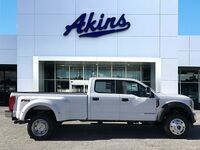 What’s Under the Hood of the 2019 Ford F-450 Super Duty Lineup at Akins Ford near Atlanta GA? And What Features and Capabilities Come Along with that Engine? Unlike its 2019 Ford F-250 Super Duty and 2019 Ford F-350 Super Duty brethren, the 2019 Ford F-450 Super Duty can only feature a diesel engine. 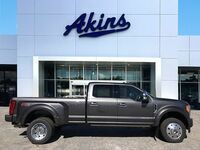 That means the six 2019 Ford F-450 Super Duty trim levels – the new F-450 Super Duty XL, the new F-450 Super Duty XLT, the new F-450 Super Duty Lariat, the new F-450 Super Duty King Ranch, the new F-450 Super Duty Platinum, and the new F-450 Super Duty Limited – all feature a standard 6.7-liter Power Stroke Turbo Diesel V8 engine. But don’t worry about not getting that regular gas engine option, as the diesel engine of the 2019 F-450 Super Duty lineup features best-in-class horsepower and torque ratings of 450 horsepower and 935 pound-feet of torque. And, as we mentioned in our introduction, those best-in-class horsepower and torque ratings are paired with a best-in-class conventional towing rating, a best-in-class gooseneck towing rating, and a best-in-class payload rating. Respectively, those ratings are 21,000 pounds, 35,000 pounds, and 7,640 pounds. 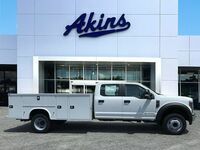 The 2019 Ford F-450 Super Duty also features a max fifth-wheel towing rating of 27,500 pounds. 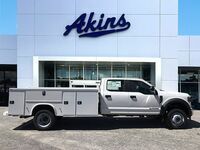 If you’d like more information on the 2019 Ford F-450 Super Duty lineup, please get in touch with our staff here at Akins Ford near Atlanta, GA. Interested in a Ford Super Duty F-450 DRW?